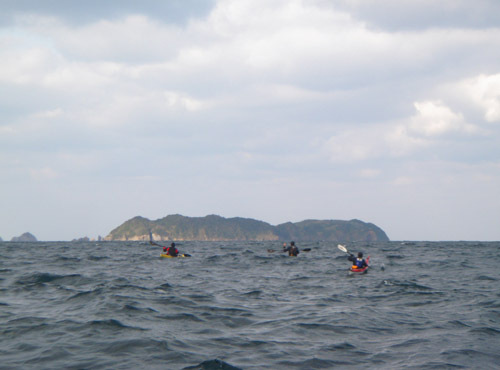 Strong north winds and 1.5 meter swell was the perfect combination for our friendJerremy as he requested to be taken kayaking. Sounds fishy to you? 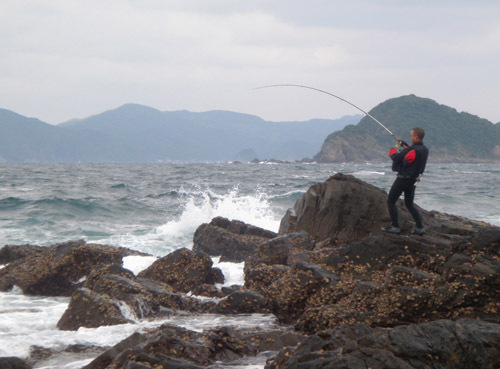 In fact, for fishing Suzuki (Japanese Seabass) these conditions are ideal. 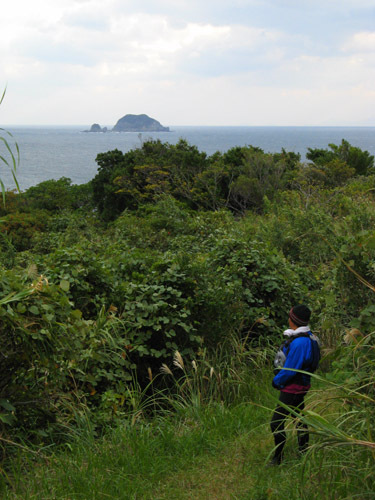 Jerremy's choice spot was the uninhabited island of Oshima in Ushibuka. 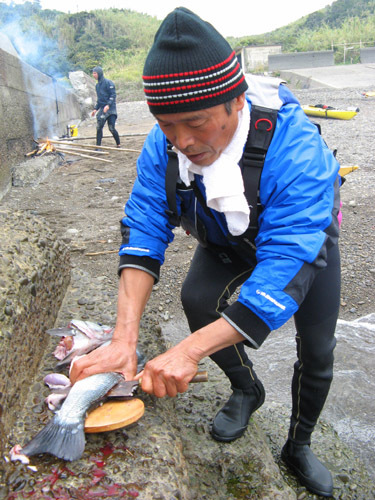 Launching from the small village of Komori, we skirted a shoal of rocks, mentally recording them for the journey home when the tide would be different and the swell larger. Stuggling a bit with the headwind, we fought our way past the old coal mine of Eboshi-Se, a unique historic site located on the sea shoals. According to the Education Ministry, this mine was established in 1897. The coal extracted from the seabed was famous with the navy as it produced "Smokeless Coal", a high quality coal that burned very hot with no smoke. Production was terminated after a few years due to water welling up from the bottom. The mineshaft opening is lined with red brick, and that together with the breakwall constructed to protect it is still very much intact after all these years of weathering rough seas. Mr. O, with his shiny new kayak and fancy tuliq. Today as usual, we had the sea mostly to ourselves. Small fishing boats were absent thanks to the bad weather. 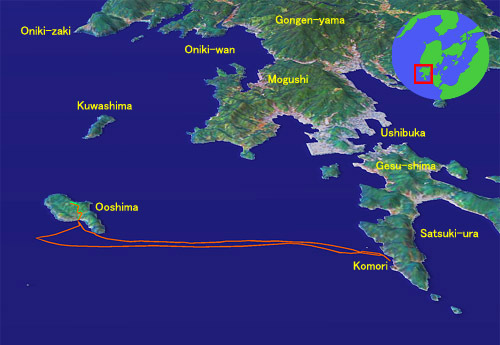 After more than an hour of hard work, we finally reached the shores of Oshima. Jerremy was so excited to go fishing that he didn't even appear to be fatigued after the arduous crossing. 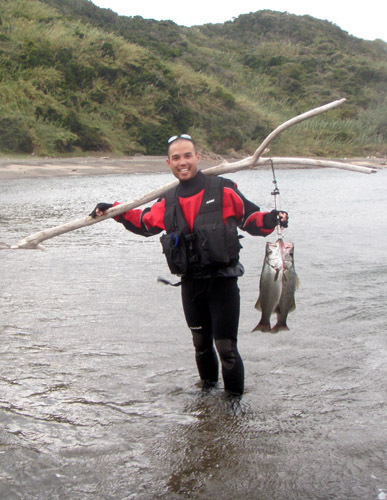 On the beach, he gave me a quick crash course in suzuki fishing. It is very important to be able to cast accurately. After a few admitttedly pathetic attempts on my part, he deemed that I was ready and off we went. Scrambling over boulders we jogged to the northern extremity of the island. The swell was impinging violently on the shore and the wind was formidable. Casting inside the sheltered port,and casting among boulders into the gale are two quite different things. In no time I managed to snag the lure on a rock. Jerremy, on the other hand wasted no time in hooking a beautiful fish. Over the next few hours as we hopped and waded from one rock to another; I managed at least to keep my lure, although I failed to catch anything. One time (at least according to Jerremy) a fish was following my lure and was about to bite, when I reeled in the line too quickly. I'll have to take his word on that one, because with the salt water crusting up my sunglasses and my primary concern being not to catch the lure on the rock, I really didn't see this happen. 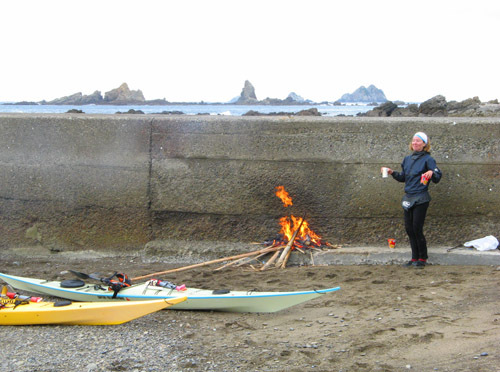 Now with two sizable suzukis, we headed back to port where we built a bonfire and ate delicious sushi dipped in ponzu sauce. 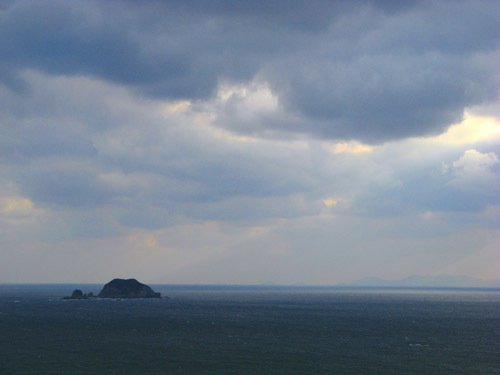 The journey home was slow if uneventful and we arrived safely back at the Komori port just as it was getting dark. The day was capped off with a wonderful soak at the nearby hotspring followed by a satisfying dinner. 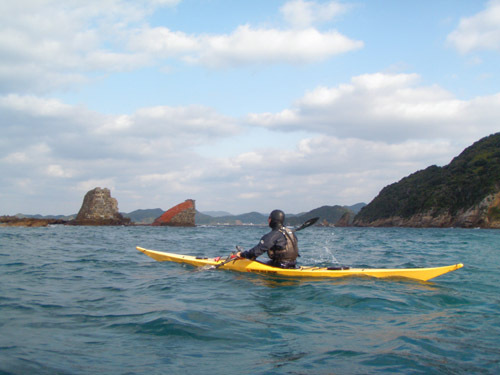 NOTE: Most people, when they are learning to kayak (and sometimes for years thereafter), only paddle in calm water. We believe this is a mistake that, in the end, compromises one's safety. 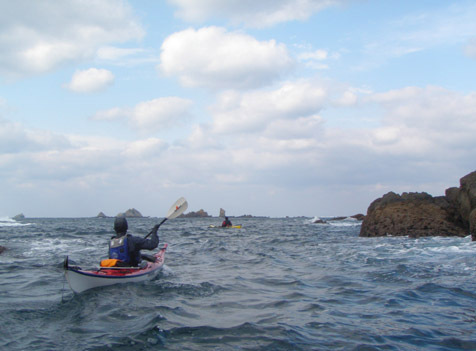 No matter how well one may check the weather forecast and conditions, the sea is too unpredictable to always guarantee that conditions will remain within one's comfort zone during a day of paddling. Sooner or later paddlers get caught in the rough, and if they lack a modicum of experience, they could be in trouble in conditions that are nevertheless eminently controllable with a little bit of practice. 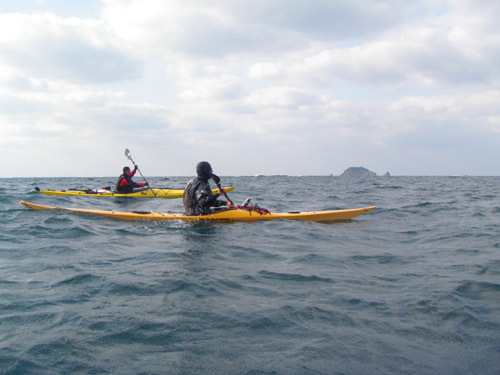 We encourage all kayakers to paddle with more experienced friends or guides in rough waters, practice bracing, rolls, and rescues, and get comfortable in that environment. 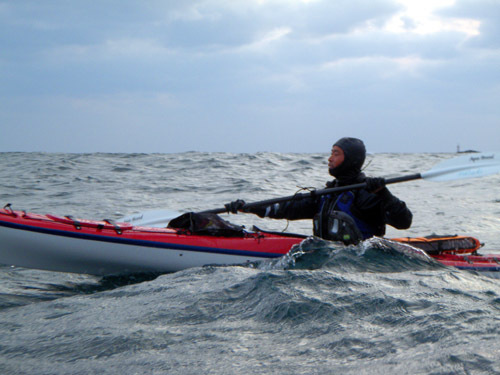 Then, when you are faced with rough conditions, you can avoid panicking, locking up, forgetting basic maneuvers, overfocusing on remaining upright to the point of not paddling forward at all, and other such predictable reactions. With practice, common sense reactions such as maintaining speed in rough water, instinctive bracing, etc., will happen on their own. thanks for taking me out. It was tiring but great fun at the same time! Look forward to the next trip! !